One of the highly anticipated apps has finally arrived, TouchPad 4.0 has just been released by the developer Edovia and now it can work with your iPhone. This newest update brings many new features to what was already one of the best remote keyboard and trackpad apps available in the App Store. TouchPad 4.0 is the first application made to work using Siri, so for those who don’t know what the app is capable of: This 4.0 update brings with it the ability to use Siri on the iPhone 4S to interact with and send text to your Mac over a Wi-Fi network. 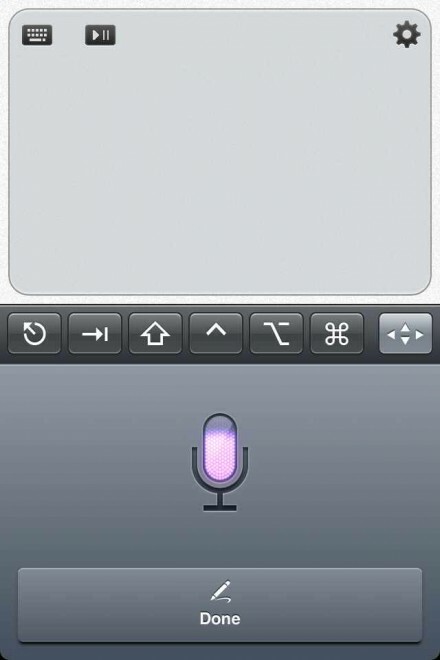 Just pressing on Siri voice icon you can talk and simply send a text with your voice to your Mac. This update also brings changes to the modifier toolbar on the iPad, support for EyeTV, new OS X Lion shortcuts, and many other bugs fixes and stability improvements. Unlike many remote control apps, TouchPad only relies on OS X’s built-in screen sharing technology, meaning that you do not need any kind of third-party server software running on your Mac. You can download TouchPad 4.0 today for $4.99.